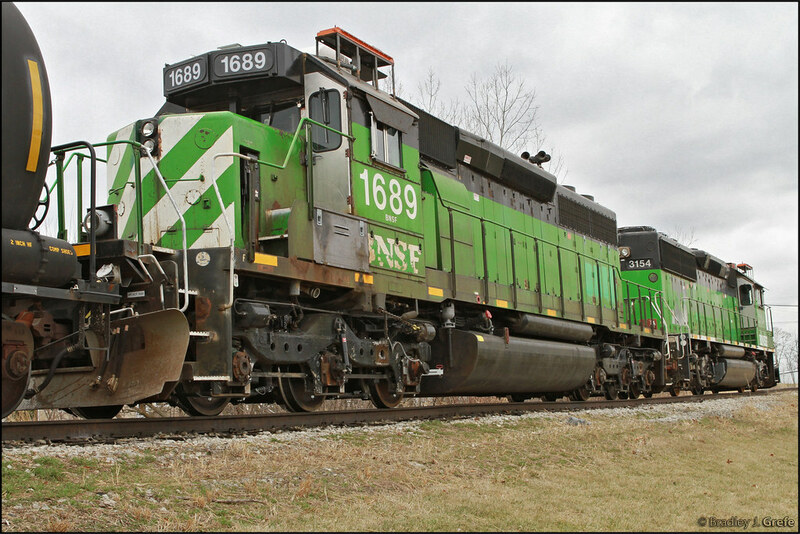 BNSF #1916 (originally BN #6325) was the first SD40-2 delivered to the Burlington Northern in early 1972. The unit has since been retrofitted with remote control equipment, and is currently assigned to yard and local service like the rest of the remaining active SD40-2's used by BNSF. The EMD (Electro Motive Division) SD40-2 (pronounced SD40 "Dash 2") is a type of six-axle, 16-cylinder 3,000hp (though, in some cases 3,200hp and/or 3,300hp) diesel locomotive built from 1972 to 1986. However, 25 specialty cowl-bodied units were built for Canadian Pacific several years after discontinuation between 1988-1989, and were classed as "SD40-2F". It is an upgrade of the original SD40; being part of EMD's improved/upgraded and more reliable "Dash 2" line. Many have been built (with over 4,000 built, with an additional 1,000 or so custom variants build; including most of the original SD40 units having simply been upgraded or rebuild to "Dash 2" standards), were purchased by many railroads and are still currently in use. Though, only CSX and Norfolk Southern still primarily utilize their fleets of units for general revenue freight service. Some railroads or railways (like CSX), are currently rebuilding many of their SD40-2 unit to extend their longevity. Others (like NS), have since rebuilt similar models (like the SD50) to SD40-2 specifications. The D&RGW was one of the only active US Class 1 railroads to not purchase the SD40-2 during its production. Rather, they purchased a specialty variant that was catalogued and marketed separately: the SD40T-2. Burlington Northern (BN), Union Pacific (UP), Canadian Pacific (CP), and Conrail (CR) had the largest fleets of SD40-2's out of all North American Class 1 railroads. Today, BNSF, CSX, NS, and the DME (a regional Class 2 railroad owned by CP) currently have the largest operating fleets of active units. Various export models with SD40-2 specs or qualities have also been built, such as the BR Class 59 (EMD JT26CW-SS) along with the GT26CW-2 for eastern nations and territories (such as Morocco and Turkey). The EMD SD40-2 is an upgrade of the original SD40 and is equipped with an improved modular electronic system and other internal features that surpassed the original model. It was the first entry in EMD's "Dash 2" line of upgraded and improved diesel locomotive models (which included improved wiring, improved dynamic braking systems, better tractive effort; among other enhancements), and was originally meant to compete with the MLW (ALCO) C-630/M630 and the U30C from long-term rival GE, but quickly captured overwhelming popularity and success leaving EMD's competitors behind. Despite it's initial success, the model unfortunately was one of the last commercially successful models built by EMD that was produced by the masses, which further maintained the locomotive builder's status as the leading builder, for GE unfortunately took the lead in 1987 with the debut of the C40-8 and subsequent full-production of the Dash 8 line, which spelled the end of EMD's dominance in the locomotive market. A CSX SD40-2 converted from an original SD40. There have been countless customized and specialized versions or variants of the model: the SD40-2F; a cowl-type unit built for the Canadian Pacific (CP), and the SD40-2W; built with a Canadian wide cab for Canadian National (CN), and many other variants as opposed to the original (as listed below). Many have been built (3,982) and many still exist as of today, but are slowly in the process of being retired from primary service on US Class 1 railroads such as BNSF, Norfolk Southern, and Union Pacific (although CN, CP, and CSX still primarily use many of their active SD40-2 units for general revenue freight service). Ironically, NS has since purchased numerous fleets of second-hand units to utilize in yard and local service, while BNSF and UP currently use the remainder of their own units for said exact services as well, but are commonly equipped with remote control features rather than being manned by switch crews. The DM&E/DME (Dakota, Minnesota, And Eastern) has the largest fleet of SD40-2's than any other North American Class 2 or Class 3 or regional railroad (including it's former subsidary, the Iowa, Chicago, And Eastern; ICE/IC&E). Although the original SD40 (and subsequent SD40-2) was rated at 3,000hp, later versions/variants of the SD40-2 were (and most still currently are) rated with an additional 200hp to 300hp as a result of having the prime-mover reconfigurated, a different alternator, or having different versions or variants of traction motors, which (in some cases) also provided additional tractive effort furthermore increasing the amount of horsepower output. Though, most of these units (being CP's fleets of SD40-2F units as well as CN's SD40-2W units and so forth) were built at EMD's London, Ontario facility, and include cowl bodies and/or "Canadian Cabs" as an easy distinction; though many standard-cab units were also built to said specifications. Some rebuilt SD40-2 and SD40 units have been rated at 3,200hp or 3,300hp as well, along with numerous SD40-2's owned by Mobil Grain Ltd. of Saskatchewan, Canada. Several SD40-2 (and subsequent models; including its predecessor) units were built without dynamic brakes. Among them were ordered from the Rock Island, Mopac, and SOO. There are many different versions and/or variants of the SD40-2 (aside from the original, preceding SD40), as well as different classifications. SD40-2F - CP Rail full-cowl carbody version (known as "Red Barns" by enthusiasts) built between 1988-1989. F40C - Cowl-bodied, F45 built to SD40-2 specs; passenger version used by the West Suburban Mass Transit District, later METRA; similar to SDP40F. SDP40F - Amtrak's first official fleet of diesels delivered in 1973; kitbashed from an F45 or FP45 with SD40-2 specifications. SD40-2B - Rebuilt cabless version of original. SD40T-2 - Built for the SP and the DRGW; has special type of cooling system. SD40-3 - Rebuilds incorporating microprocessor controls and improved cab system and design; notably from CSX. SD40E - NS rebuilt SD50's with SD40-2 components and engines. SD40M-2 - Rebuilt SD45, SD40, SDP45's built to "Dash 2" specs by Morrison-Knudsen to SP. SD40-2R - BNSF classification for SD45-2's rebuilt to SD40-2 specs. SD40N - SD40-2 Rebuild Program by UP Jenks Shop. SD40A - SD40 built on a SDP45 frame. SD40-2W - Used on BC rail and CN; wide-cab Canadian built variant. SD40-2ECO - Experimental LNG (Light Natural Gas or Liquified Natural Gas) SD40-2 used on the BN; fitted with flared radiators reminiscent of an SD45. SDP40 - Modified passenger version of the SD40 with an equipped steam generator; the "P" meaning "passenger". SD40-2H - High-speed version or variant ("H" for "high-speed" or "high") built specially for the Union Pacific; was often designated or rated at 3,200hp and consisted of having a "snoot nose". SD22ECO - Rebuilt KCS SD40-2 with SD40 conversion kits; powered by EMD 710-engine. SDP40-2 - Rebuilt SDP40 upgraded to "Dash 2" specifications. SD40-2S - Experimental testbed variant of the original SD40-2 which was delivered to BN and UP between 1978 and 1980 (also incorrectly known as the SD40-2SS or SD40SS). Had distinct radiator sections as well as improved engine blocks, larger turbochargers, and two-speed radiator fans which were expected to improve cooling and reliability. It was also rumored that they were equipped with D87 traction motors and AR15 (or AR16) alternators present on the succeeding SD50, yet these rumors are yet to be confirmed. SD40-2C - "C" meaning "Coal". Said units were 20 delivered to Mopac (3216-3220 and 3221-3235) equipped with dynamic brakes and were built to BN specifications for use in the Powder River Basin in Wyoming, and were meant to be compatible with the CNW, UP, and BN units equipped with dynamic brakes. They were also equipped with oscillating nose lights (similar to what was used on the DRGW), and eventually renumbered as MP 6000-6019 to separate them once they began receiving more without said features. SD40-2Q - CN rebuild of an SD40 (also designated as a SD40u, SD40-2QRM, and/or an SD40-3). Note: "SD40-3" is also a common specification regarding existing SD40-2, SD40, or similar models upgraded to "Dash 3" specs. Such example being the SD40-2's owned and operated by Mobil Grain Ltd.
CSX SD40-2 #8888 "Crazy Eights" was a unit which was involved in the infamous runaway which occurred in Willard, Ohio in 2001. Such incident inspired the 2010 film "Unstoppable" (though ironically, AWVR #1206; the SD40-2 in the film, was portrayed as a "hero" as opposed to being a "villain" like CSX #8888). Though, it unfortunately is currently awaiting its next fate to be converted into an SD40-3 at CSX's Huntington, West Virginia shops. During the early 1990's, the Burlington Northern (BN) experimented with the usage of Light Natural Gas or Liquefied Natural Gas (LNG) on two of their SD40-2 units. The experiment was a success, but it was deemed to be to expensive to replicate, and the units were eventually placed in storage. Several years later, they were sold-off to HLCX after the BNSF merger and were recently purchased by NS (Norfolk Southern); such as NS 3528, which surviving example of one of the units, and was one of the many SD40-2 units acquired from HLCX by NS in 2013. Ironically, the unit still retains it's distinct radiator section despite undergoing a complete overhaul. Two CN (Canadian National) SD40-2W units were recently converted to also use liquefied natural gas, and are part of an experiment or program to conserve fuel consumption and make fuel spending more economical for the railroad and the environment (similar to what BNSF has been doing with their SD70ACe units); despite LNG fracking being more potentially harmful for the environment. CNW 1 (the fuel tender currently used by the converted SD40-2W units) is actually a former UP/CNW Light Natural Gas (LNG) fuel tender used as part of preceding experiments conducted by the tender's previous owners. This was the very first article or page on this site. Locomotive 2012; a Trains Magazine special issue, celebrated the SD40-2's 40th anniversary or birthday during 2012 by dedicating a complete section to the special locomotive. The magazine itself, also regards it as the 9th locomotive that changed railroading out of their "10 locomotives that changed railroading" list. KCS (Kansas City Southern) #637 was the very first SD40-2 ever built, but was unfortunately scrapped (unlike IC #6071, the first SD40 ever built which was preserved). The SD40-2 is considered to be one of the most popular locomotives of many railfans, and is easily distinguishable from other types of power due to the frame "porches" both front and rear. The type of locomotive has also been said to be the known as the "Chevy Silverado of Diesel Locomotives" as regarded by some enthusiasts. BN #6325 (the first SD40-2 unit delivered to the railroad's later massive fleet) was eventually renumbered and repainted to BN #1976, though it was involved in a grade crossing accident during its debut, furthermore being replaced by former GN SDP40 #9853, and was eventually renumbered to #1876 to commemorate the centennial anniversary of the United States (while #1976 served as a "Spirit of" unit, though the original retained such slogan after the incident). Like every other locomotive built by EMD other than the GP59 (being the only other short hood production unit ordered by either railroad); the Southern Railroad and Norfolk And Western railroads (including their successor; Norfolk Southern) had "hi-hood" or "high, short-hood" variants of the SD40 and subsequent SD40-2, to whom the short hood, front hood, or "nose" of the locomotive was extended to provide better safety (as well as better weight stability) for head-on collisions; thus, the "high-hood" being an early example of a safety-cab. Several SD40-2's were been built with "snoot" style noses, which are extended hoods on the front of a diesel locomotive meant for housing special components or utilities (including a small lavatory or restroom with a toilet) like with UP's SD40-2H units (see below). Such specialized components included Locotrol equipment, which gave the ability for an engineer of a lead locomotive at the front of a train to operate sets of multiple locomotives from the middle to the rear of said train by transmitted radio signals. Numerous SD40-2 units owned by the UP were once rebuilt with "high-speed" specifications (right around or during 1976-1977) which were often classified as a "SD40-2H". Such units were often regarded as some of the first 3,200hp units built. They have since been rebuilt into "snoot nose" SD40-2 units; though the nose design was originally meant to house the special equipment and gear (besides serving or acting as a form of streamlining) to give the units additional speed and tractive effort. Oddly, the Southern Pacific had two SD40-2's rebuild into SD39's and repainted into D&RGW liveries for the 1997 film "Switchback". What makes this unusual, is the fact that the D&RGW never owned any SD40-2's, let alone SD39 units. Most of the Illinois Central's fleet of SD40-2 units had their center radiators or dynamic radiators removed, and were often designated as a "SD40-3". Oddly, two former SP SD40-2 units were rebuilt and repainted into the D&RGW scheme for the filming of a low-budget action film (similar to how the SCRX former D&RGW GP40 was used). Both units still remain in the scheme, yet they aren't from the D&RGW's heritage. Ironically, the Canadian Pacific Railway (CP) purchased several former Norfolk Southern "hi-hood" units and eventually converted them to be used as "B-Units", designating them as a SD40-2B, yet their cabs simply had their windows platted over as opposed to being completely rebuilt. The CP also purchased a fleet of former KCS (Kansas City Southern Railway) and UP (Union Pacific) SD40-2's; some of still remain in their original paint. Many former BN SD40-2 units have been leased by various different leasing companies; as well as a fleet of former BN SD40-2's were actually purchased by Norfolk Southern to replace several fleets of former N&W and SOU "hi-hood" SD40-2's which were recently retired. As of 2011, NS has also rebuilt several more fleets of their "hi-hood" SD40-2 units to have a unqiue type of safety cab known as an "Admiral Cab", which as a thicker and taller hood, as well as having "Whisper-Cab" features like with the EMD SD70I and SD60I. The particular type of cab is similar to the "Cresent Cab" used on their SD60E units. The term, "Admiral Cab" is actually the nickname of the unique cab given by rail employees and railfans to which the cab interior resembles an "Admiral's Quarters" on a naval vessel or ship. NS 3329 was once actually the very first Conrail SD40-2 ever purchased by the railroad, as well as wearing an exclusive Maersk Sealand intermodal scheme to celebrate the opening of a new intermodal facility in California. This unit still remains on NS' roster, but no longer wears the exclusive Maersk Sealand scheme. CP 6078; a SD40-2B (known as the "odd-ball SD40-2 by railfans); is actually a converted SD40-2 which was wrecked, but never fully restored. Thus, retaining everything but its original controls and cab components. KCS has also converted a fleet of "snoot nose" SD40-2 units into SD40-2B units for MOW (Maintenance of Way) track repair service. Some of BNSF's SD40-2B units are actually rebuilt from former BN SD40-2 units, while the others are from the ATSF's heritage. CP also briefly equipped several of their SD40-2 units with radiator "smoke deflectors" (or "radiator shields") similar to what was used on the GP40X units owned by the SP. NS rebuilt several of their SD40-2 units into SD38-2 designated units for yard and local train service, but have since been reconverted back into SD40-2's as of 2014, for the project occurred in early 2013. Several former MP non-dynamic brake equipped SD40-2 units (inherited from the UP as a result of the 1982 merger) were rebuilt into units classified as "SD38-2" for hump-yard service. BNSF #6327; a former BN (originally GN) SDP40, serves as an example of a surviving non-"Dash 2" passenger variant of the original SD40 which was a member of a decent-sized fleet owned by the Great Northern for passenger service. NREX #9402 (a former SSW/SP SD40T-2) was rebuilt into an SD40-2 having the long hood replaced. Oddly, it still retains its original frame, giving it an unusually long and disproportionate carbody. As of early 2017, several of BNSF's active locomotives that have been repurposed into yard and local service units are currently being retrofitted with a unique cab upgrade (known as a "Thomas Brow") to house air conditioning units and Positive Train Control (PTC) equipment for intercity yard operations. To date, SD40-2 #1689, GP40M #3006, GP25 #3154 (an ex-ATSF GP50) and numerous other units have received said upgrade. BN #7502, which was rebuilt into a cabless SD40-2B dubbed as an "SD42B". SP #9182, an SD45T-2 rebuilt into what was considered to be an "SD42T-2". EMDX #6303, a rebuilt ex-SOO/MILW SD40-2 classified as an SD42-2E. Allegheny and West Virginia Railroad (AVWR) #1206 (the railroad itself, is entirely fictional and was created for the film "Unstoppable"), which chased after two runaway AC4400CW's leading a train hauling toxic chemicals. A BN (Burlington Northern; originally GN/Great Northern) SDP40 which was once owned by the BNSF until its donation to the Minnesota Transportation Museum in 2009. C&O SD40 #7534 (now CSX #4617). CSX #4617 when it first received its number patchwork. A BNSF SD40-2B (cabless rebuilt of a former cabbed BN unit). C 6071 (ex GM&O 950, nee EMD 434) is a SD40X built in 1964, which is often regarded as the very first SD40 ever built (though the unit itself was eventually rebuilt as a SD40A by the IC later on during its life). GM&O SD40X #950 (before becoming IC #6071). CSX #4617 being towed with two of the three remaining Chessie System-painted units (on CSX's roster) in 2008, just before it was repainted in 2009. The rear of an SDP40 revealing the distinct steam generator compartment (once used for housing a steam generator for passenger purposes). Two rebuilt former SP D&RGW-painted SD39 units (rebuilt from SD40/SD40-2 units) used for the filming of the movie "Switchback". An ex NS CP-patched SD40-2 "hi-hood" unit. A former NS SD40-2 converted into an SD40-2B by the CP. A former UP-painted CP SD40-2. A former KCS-painted CP-patched SD40-2. An ex-BN SD40-2 which was acquired from HLCX by NS, and serves as a new entry for its existing SD40-2 roster. NS 3329; the very first Conrail SD40-2, painted in the Maersk Sealand exclusive scheme. An ironic photo opportunity; NS 5401 poses with NS 3329; the first CR SD40-2 and one of the last Conrail-painted SD50 units on NS' roster. CP SD40-2B #6078; the "odd-ball SD40-2", converted from a cab unit (notice how the cab windows are plated over). A KCS SD40-2B converted from a "snoot nose" SD40-2. A diagram example of a NS "Admiral Cab" design (notice how the window frames, hood, and number board plates are slightly different from the original short hood cab on original SD40-2 units). An NS "Admiral Cab" SD40-2 (rebuilt from a "hi-hood" unit). Another example of a NS "Admiral Cab" SD40-2 revealing the distinct nose or hood. A CP SD40-2 with a "radiator shield" used for improving the air intake quality for the rear radiator section (similar to that of a "Tunnel Motor"). NS #3821: one of the several SD40-2 units converted into a SD38-2, and has since returned back into its original "self". A grey-painted CN SD40-2 which is actually one of the many former Wisconsin Central (WC; units originally owned by the Algoma Central) SD40-2 units which were absorbed into the railroad after the WC's purchase in 2001. A standard-hood (low-short hood) N&W SD40-2 on an SD35's frame, which was originally a "straight" or "true" SD40 upon construction. A former UP (originally MP) CN SD40-2. An SD40-2 at Altoona, PA, showing how the original high-hood cab has been cut clean off for replacement by an Admiral Cab. The electrical cabinet normally located behind the cab of an SD40-2. A high-hood SD40-2 in Altoona, PA, awaiting conversion to becoming an Admiral Cab unit. BN #1976 (formally BN #9853); former GN SDP40 serving as a replacement for the SD40-2 (BN #6325) which originally retained said commemorative number (being #1976). A KCS SD22ECO (rebuilt with components from an SDP40). BN #1876 (the original #1976) with GE U30C #1776 hauling an American Freedom Train special during the United States' bicentennial anniversary in 1976. Two UP SD40X units working in hump yard service in North Platte, Nebraska on October 7th, 1986. UPY #861; a former MP SD40-2 rebuilt into an "SD38-2". DME (Dakota, Minnesota and Eastern Railroad) "Mount Rushmore"; the commemorative 50th anniversary (1941-1991) SD40-2, serves as a prime example of one of the many SD40-2's owned by the railroad (with the DME currently owning the largest fleet as of today, beating previous records). A typical SOO SD40-2 (without dynamic brakes). An overhead view of NREX #9402 revealing its unusually long frame (which originally was meant for housing the long-hood of its original basis; being the "Tunnel Motor" of an SD40T-2). Another view of the unit. CNW 1 (tender used for the CNW, UP, and CN's LNG experiments) before and after comparison. One of the BN's light natural gas SD40-2 units converted for the experiment. Two of the CN's converted SD40-2W units undergoing Light Natural Gas testing in early 2013. CSX "Crazy Eights" wearing its YN2 scheme. CSX #8888 as seen in Huntington, WV awaiting conversion to becoming an SD40-3. An FXE (originally N de M) SDP40-2; a rebuilt SDP40. UP #1996 and #1896: the earlier Olympic Torch Relay SD40-2 units which retained the current numbers given to #1996 (the SP SD70ACe heritage unit) and another SD40-2 (now SD40N) unit with the same number. Two TORC (ex-CSX); TORCO, Toledo Dock, or Toledo Ore Company, SD40's retaining CSX YN2 schemes. CSX has since scrapped and/or rebuilt many of such units leased to their respective affiliate (some which have since resided at their Huntington, WV facility). Remote-control equipped Chessie SD35's leased to TORCO (similar to what successor CSX did years later). NS #3528 (ex-BN LNG SD40-2). Another view of the unit before it underwent overhaul. NS #3528 as of today. NS' current 3500 series SD40-2 fleet, which replaced a fleet of their GE B32-8E units sometime in 2013 (the remaining B32-8E's are now numbered in the 500 series). The control stand of a CSX SD40-3. A pair of Mobil Grain SD40-3's. An ex-CNW SD45 rebuilt by MK Rail for SP classified as an "SD40M-2", or an "SD40-3" due to having been rebuilt to SD40-2 specs. The 25th Anniversary WSOR (Wisconsin Southern Railway) commemorative SD40-2. Another special WSOR SD40-2 dedicating the railroad's service to the state of Wisconsin. The unit was one of the only acquired from MP heritage (built as MP #3213 in August 1975). An early merger-era Mopac SD40-2. WSOR #4053 prior to when it was repainted. A "Screaming Eagle" MP SD40-2. An MK Rail SD40-2 demonstrator. Newly-delivered ex-NS (nee CR) CSX SD40-2 undergoing patchwork and renumbering (note the numberboard lying on the front "porch"). Two CSX (ex-NS, nee CR) SD40-2 units. A converted CP SD40-2 meant to run on compressed natural gas (CNG) coupled to its tender.